ruthdelacruz | Travel and Lifestyle Blog : Blog Giveaway: Win 2,000 GC from Wrangler Philippines! 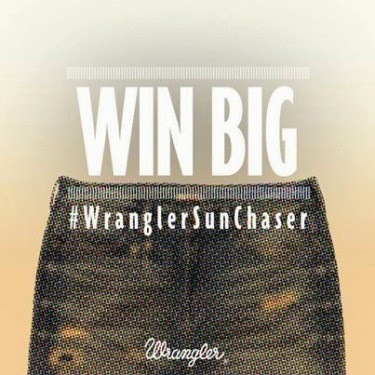 Blog Giveaway: Win 2,000 GC from Wrangler Philippines! The golden rays of the sun greeted me this morning, and there is always a reason to smile even if I do not wake up with the view of the mountains or the sea. 2. Join my giveaway to get a chance to win Php2,000 GC from Wrangler Philippines! The thrill of seeing something for the first time -- it's in our DNA and in the spirit of any adventurer. This week, rise to the morning sun and venture somewhere you've never been before, make a "first time" memory. Be iconic! Now, for my giveaway, click Read More..
Let's go! Let's chase the sun! © ruthdelacruz | Travel and Lifestyle Blog : Blog Giveaway: Win 2,000 GC from Wrangler Philippines!